The awful British summer has been good for one thing and I've made loads of progress with this team. It is pretty much done over a month before the actual Star Bowl itself. I've done 2 of each standard lineman and made 1 blonde and the other brunette as well as a couple of small colour scheme changes to help differentiate them. The other player is one of only 2 conversions on this team. A while back I got a few 2nd edition models really cheap on e-bay as they were missing limbs. The idea was to use them for conversions or to decorate bases. 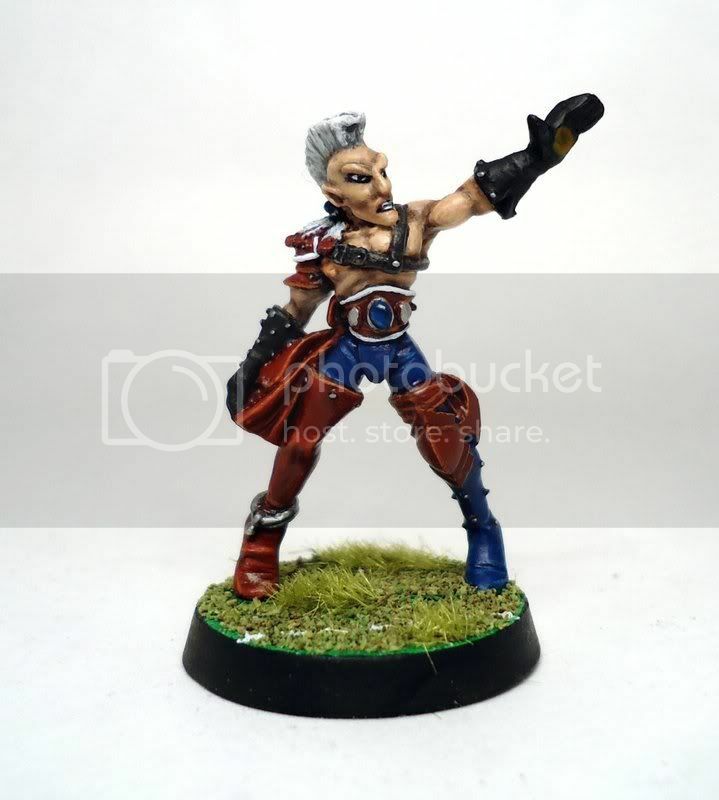 Since even elves don't need 2 kickers (and the original pose is a bit crap) I used a couple of spare dark eldar wyche legs to turn him into the team fouler. I added a skull as he's about to make absolutely sure that skeleton won't be regenerating. This is the final catcher, he's a duplicate as well so gets a similar treatment to the linemen with blonde hair. I see throwers as being able to be a tad older since they don't get stuck into the scrum so gave the 2nd one white hair to reflect his experience. 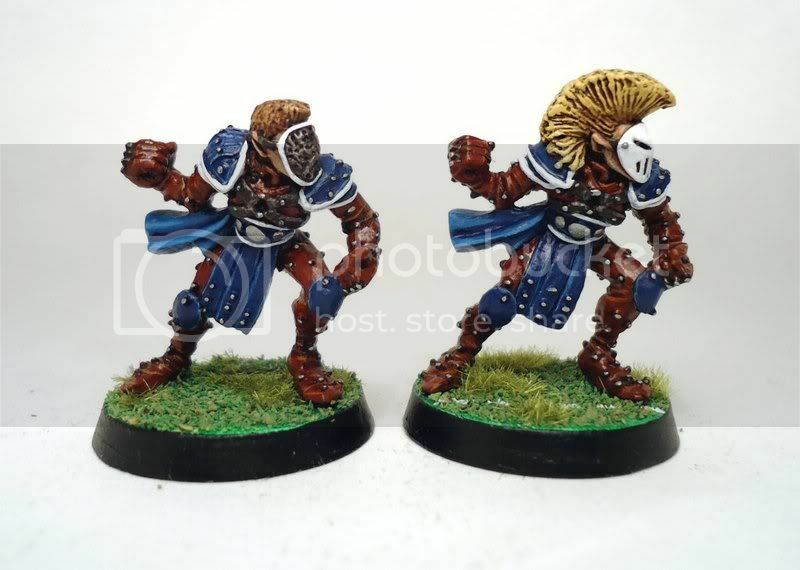 The Blitzers are probably my favourite models in the range, especially the guy on the right, though I like all the models with face masks. 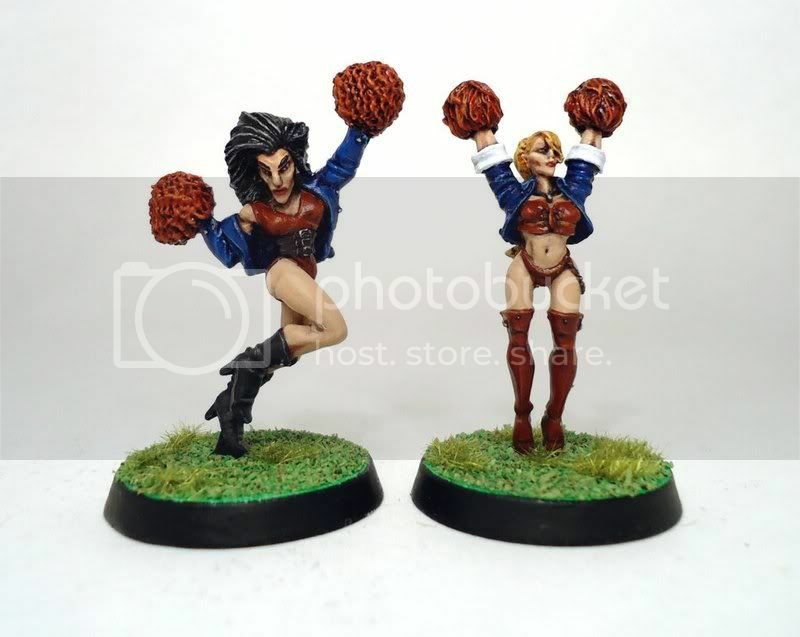 I've done 2 cheerleaders for the team, the 2nd edition one and the one and only 3rd edition model in the team from the pro elf team. I'm not entirely happy with the gal on the right as she does look like a drag queen, but it is hard to tell with elves anyway. Finally as this is a Star Bowl team I painted up a star player in the shape of Eldril Sidewinder. To make him stand out a little more I reversed the colour scheme and gave him blue leggings with red shoulder pads and belt. He's also got a plastic dark eldar leg as I got him in the e-bay batch too. The one outstanding task is to give them base numbers, I have 3 ideas and would like suggestions. 1. Paint the numbers on the bases, this is quick and easy but I don't think it would look as good. 2. Paint the numbers on the studs of the shoulder pads, the trouble with this is that the numbers will be very small and may not be that clear on the silver. 3. Paint a white star on each player's hip and then paint the number inside it. I think this would look the best as long as I can get the star the right size. It would be tricky on the blitzers due to their entire leggings being studded. Beautiful as ever, especially the Blitzers. I know I'm wrong because everyone who knows what they're talking about loves second ed. minis, but I'll never understand the love. They just don't do it for me. Still, I'd look at a plank of wood painted that well. I never realised elves had such enormous faces. I'm with PG. 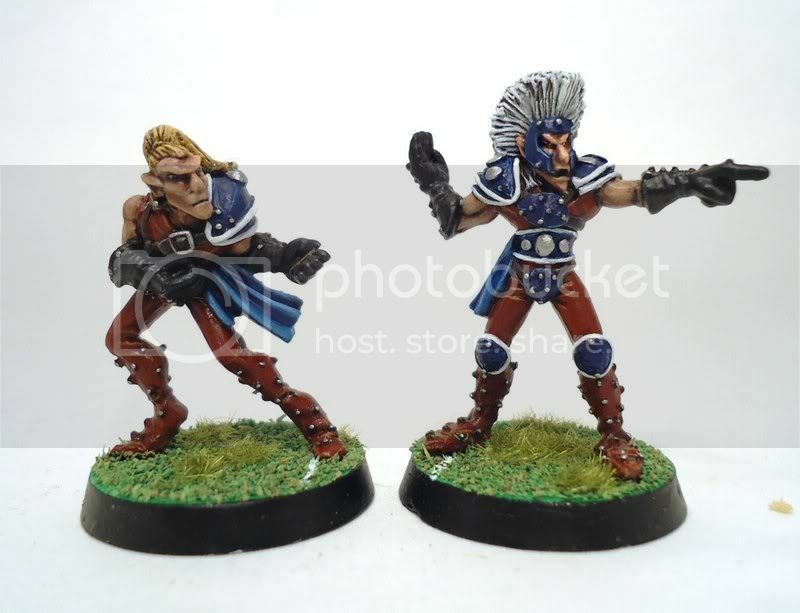 These elf minis are so ugly that no outstanding painting can save them. Option 3 for me. Star with the number inside it. if you manage to find a solution for the blitzers, the star is a nice solution. awesome painting, as usual with you. i like the effect of this very shiny red/blue you chose. and i actually like the minis from 2nd - and the fouler is unique and a nice idea. Then you're NOT with PG. He says that it doesn't matter how ugly the minis are because the paint job is so good. I think the left blitzer is a horrible mini, it looks like he used a sieve for a face mask. The right one, however, is brilliant. The paint is great, as always. I personally like the numbers on the bases. as you say with these elves you can't always tell gender. On the gender issue, Eldril seems to be packing a large calibre weapon or is heavily padded to add more ambiguity. On the models themselves, they were ugly back in the day and age has done them absolutely no favours. I think you've flattered them as best as could be done though. 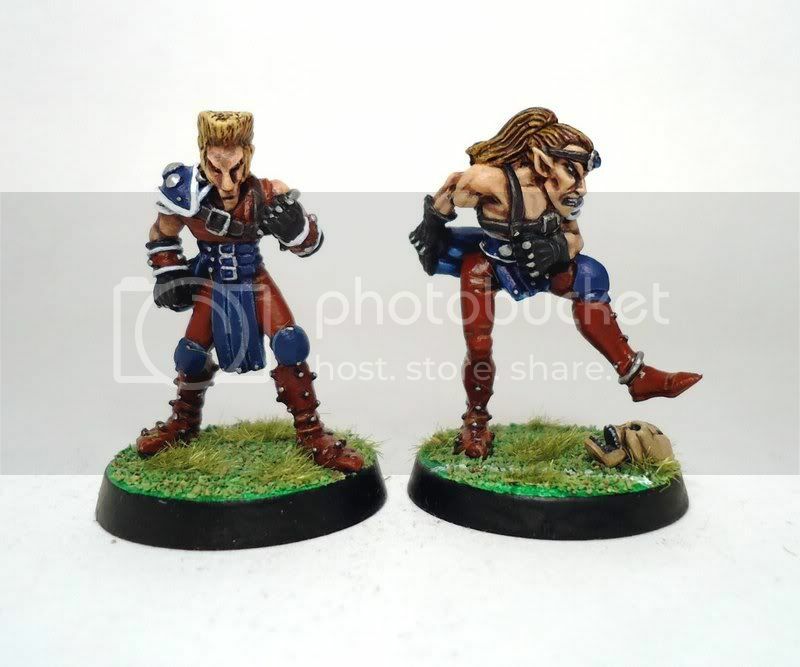 It's interesting this blog is commented upon by people who aren't fans of these minis. I thought I was the only one! People generally fall over themselves to praise anything 2nd ed. From the eye of a pro, spubb, what are we missing? Why are these ace? There are some very good 2nd edition miniatures, mainly with the Chaos, Troll & snotling type as they seemed to show a lot of imagination. Also the Warhammer Chaos models of that time were fantastic. But I don't think most of these elves are at that level. Blitzer 2 is good. Excellent paint job!